Looking at the map, it indicates that the Hangang River & Geumgang River near the west sea, and Nakdonggang River Seomjingang River near the south sea represent areas where these wide rivers narrow as they reach the sea. As the rivers flow between the mountains and forms stream, they eventually reach the seas to form estuaries. At these estuaries there are well-formed deltas, tidal flats and natural embankments. Mangyunggang River, Dongjingang River and Yeongsangang River located around the reclaimed land of Saemangeum on the west sea have a lot of bays and islands offshore and widely-formed tidal flats made possible by the tidal range. The rivers of the east sea, compared with those of the west/south sea, are small in size and have little tidal range representing very simple natural estuaries. 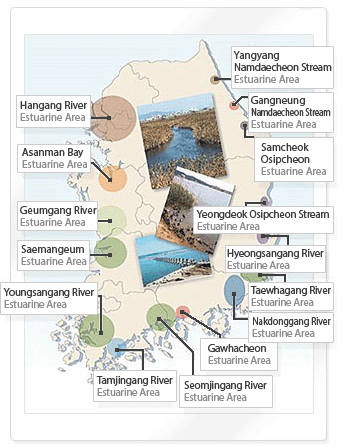 Most of the major estuaries in Korea have banks constructed to avoid the damages caused by the salt of the sea water, therefore somewhat losing their natural features as estuaries. The only river without an estuary embankment out of the 4 major rivers (Hangang River, Geumgang River, Yeongsangang River, Nakdonggang River) is the Han River which is situated at the borderland. As for the rest of the rivers, they all have embankments constructed at the estuaries, along the end of the rivers, so “brackish water regions are reduced between the divide of the sea and the rivers. This has caused difficulty with wildlife moving between the rivers and the sea. Also, the swampy lands around the estuaries have been reclaimed to resolve their lack of utility and used for industrial complexes.